Texas Early Music Project male singers. Temmo Korisheli, Daniel Johnson, Tim O’Brien, Thann Scoggin, Gil Zilkha, Steve Olivares, Eric Johnson, Heath Dill as part of Notre Dame Cathedral, c. 1200 — March 25, 2017, St. Mary Cathedral, Austin, TX. Iberian monophony, Notre Dame polyphony, Medieval mystery plays, Renaissance madrigals, Baroque operas, French virelai, Spanish villancico, Italian frottola, Scottish ballades, Sephardic love songs, and much more—early music encompasses a dazzling wealth of forms and styles. 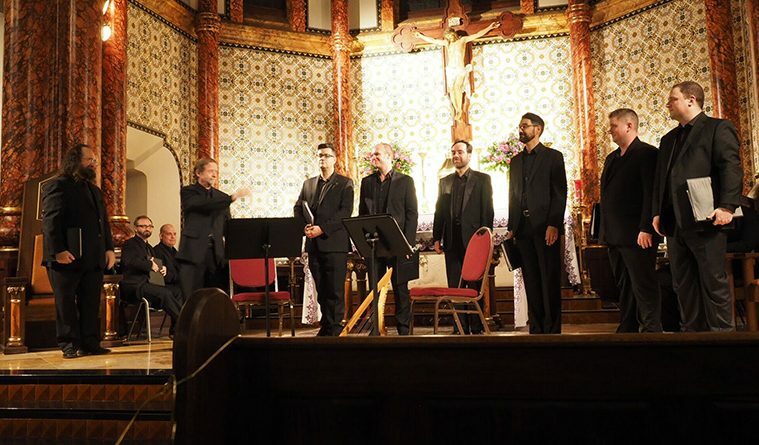 Listeners can trek through the Medieval, Renaissance, and Baroque eras, traversing austere monasteries and resplendent cathedrals, royal courts and grand palaces, and famed cities throughout Europe: This is the rich domain and lively playground upon which the Austin-based Texas Early Music Project (TEMP) has thrived for the last 30 years. On May 13-14, audiences will have the chance to hear one of the most compelling and sublime sacred compositions of all time, Claudio Monteverdi’s Vespers of 1610, a work of such monumental reputation and profound influence, it defies words and should be universally experienced, like Bach’s St. Matthew’s Passion or Handel’s Messiah. Monteverdi’s Vespers bridges the transition from Renaissance to Baroque, demonstrating both the highest expression of the old (cantus firmus technique, divided choirs, strict a cappella polyphony), and a creative vision of the new (operatic recitativo, combined voices and instruments, figured bass, virtuosic solo singing, dance forms). It gets a superlative in every category—technical prowess, musical imagination, emotional punch, shock and awe, all qualities that TEMP frequently delivers in its distinctive concerts. 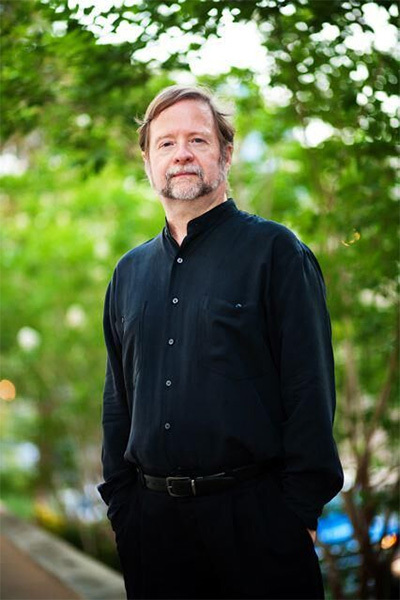 Founded in 1987 by artistic director Daniel Johnson, who at the time was teaching and directing the UT Early Music Ensemble (EME), the project began as a unique venue in which students of the ensemble could work and perform with early music professionals, giving them the opportunity to explore repertoire normally beyond their reach. Johnson’s work with the EME (1986-2003), producing and conducting 98 concerts in 17 years, inspiring hundreds of students from every corner of the university to fall in love with early music, and fostering the growing professional early music scene in Austin, would earn him Early Music America’s most distinguished Thomas Binkley Award in 1998. By then, Johnson had firmly established himself as a leading early music specialist of international renown. He performed on tours with major early music ensembles in the United States and abroad, taught regularly at early music meccas such as the Amherst Early Music Festival, Berkeley Early Music Festival, and San Francisco Early Music Society, and recorded with Musa Iberica in London, the New York Ensemble for Early Music, and San Francisco’s Heliotrope. His vast experience in scholarly research and performance practice, his knack for discovering and recruiting new talent, and his camaraderie with the best and brightest early music stars, proved instrumental to the high quality of TEMP’s musical offerings. Since 2003, TEMP has offered what Johnson describes as a “relatively calm” six-concert season, as compared to a more chaotic time from 1999-2002, when TEMP put on an annual Midwinter festival/early music bonanza of six consecutive weekends that was wildly exciting, but ultimately too exhausting to sustain. A typical season now resembles a survey course of early music, and usually includes one Medieval, one Renaissance, one Baroque, one ethnic (Sephardic or Celtic), one Christmas program, and one theatrical production. Meredith Ruduski, soprano, with Billy Traylor, harpsichord and Jane Leggiero, cello in Love’s Grand: The Sweet Delights of Baroque Opera — February 19, 2017, First Presbyterian Church, Austin, TX. Photo by Pat Brown. Johnson puts a lot of thought into creating an overarching theme for each season, continually reimagining more than 600 years of richly varied early music history and musical transformations throughout Europe to connect past to present through music that reflects the aspirations, passions, and humor of peoples throughout time and place. He may take the audience on an Eurotour one year—exploring the Muslim, Jewish, and Christian cultural and musical confluence in Renaissance Spain in a program called Convivencia—then hop on through Europe with London City Limits (Purcell operas and English masques), Paris City Limits (masterful chansons by Josquin and dazzling chansons by Janequin), Dutch Treat, and Pilgrimage through Iberia. He may focus on something more abstract like the many-hued harmonic palettes that illumine various styles of early music, the alternately transparent or dense textures of English and Franco-Flemish a cappella styles, the sparkling ensaladas (a musical salad) of Mateo Flecha, and the ravishingly original 13th century Carmina Burana (not the Orff), with its exotic bagpipes and a full complement of medieval instruments (rebec, crumhorn, psaltery, cittern, recorder, shawm, sackbut, etc.) mixed with vibrant vocal timbres. “This season,” Johnson explains, “is about impetus… events that caused musical change to happen, either cultural or musical events that started an avalanche of the next current of musical evolution.” The first program of the season drew a line of influence from Heinrich Schütz to Dietrich Buxtehude to J. S. Bach; the Notre Dame Cathedral concert in March took audiences all the way back to 1200, when the Notre Dame school of polyphony, led by Pérotin, flourished, ushering in the transition from single-voice chant to four-part polyphony, a foundational event in the history of Western Music. It was effortless, sitting in the beautifully restored Neo-Gothic St. Mary’s Cathedral, with a view of the splendid altar domed in Marian blue and gold-dusted stars, to go back 800 years and imagine how this complex, dazzling polyphonic repertory, so new and modern, must have sounded to people of that time. Johnson jokes that he is a “Jack of most trades.” An early music director wears many hats. He is a researcher and detective of sorts in digging through manuscripts to discover hidden gems; he is a transcriber and orchestrator in recreating works that have scant directions; he is a historian who can weave a narrative around the music to make it relatable to modern audiences; he is a theoretician and performance practice expert who can construct a historically informed performance; and he is a conductor/director who knows when to get out of the way to let the musicians do their magic. Looking toward the future, Johnson would like to do more in the way of outreach to underserved populations. TEMP already performs yearly concerts at the Texas School for the Blind and Visually Impaired. “It’s a thing of wonder to be with those kids,” Johnson reflects, “They hear so deeply, with such a different approach, and ask such incredible questions.” TEMP holds auditions every year to recruit new talent. Adding younger players is essential to keeping early music alive. Like most performing organizations, engaging a younger audience is part of the mission. To that end, TEMP has established an endowment to perform outreach concerts at area high schools, as well as creating a scholarship fund to award season tickets to high school students. 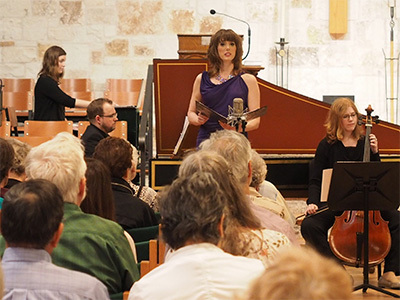 Austin is already a regional hub for early music; Johnson would like to see it continue to grow into a national early music hub. 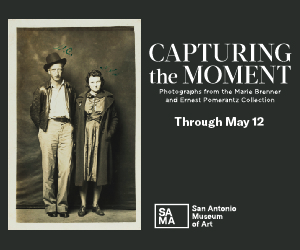 Austin has always been open to the hip and experimental. In a way, early music fits perfectly into that alternative scene. During his earliest days in Austin in the 70s, Johnson performed as a member of the early music theater troupe Clearlight Waites, with mimes, jugglers, and actors. “We were one of the house bands at the legendary Maggie Mae’s on Sixth Street,” he fondly recalls, “we even had our Medieval rebecs hooked up with electric pickups!” Imagine that—rebels with a cause rocking an early music jam! TEMP, of course, is nothing like that, but it is a project that has kept its young heart and sense of discovery, and it has the flexibility to continue growing, evolving, and redefining early music’s relationship with a modern audience.